Oh summer! While it’s hard to tear ourselves away from our beloved home of Portland, Oregon, where there is so much going on during these precious sunshiney months (among so many other things we have enjoyed such summer rituals as Trek in the Park, the Providence Bridge Pedal, I’ve been having a great time leading historic walks with Portland Walking Tours, and this isn’t even touching on all the picnics, neighborhood gatherings, potlucks, farmers markets and other copious food-centric summer events in which we’ve been participating), our typical desire to get out of town and explore the rest of the world is relatively low. However, we have to balance all that domestic bliss with some adventure! Joe goes off the deep end at Crater Lake. OH CAMPING! We have been very lucky and able to get out and about the Pacific Northwest at large quite a bit. We managed to spend one night on the Oregon coast near Rockaway Beach, did an overnight backpacking venture into the Opal Creek wilderness, spent a weekend at the unforgettable Crater Lake, and are about to embark for three days in Glacier National Park in northern Montana, which is set to be followed by a somewhat ambitious trek to the summit of Mount St. Helens in early September. 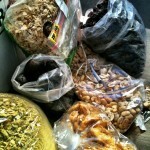 As you can imagine, all this hiking and outdoor activity provides a spectacular excuse to eat lots and lots of food! It’s fuel. Right? Yes. 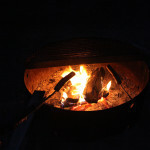 While many of us have childhood memories of campfire sustenance centered around stringing hotdogs onto sticks and turning marshmallows into mini fireballs, growing up into people who love to cook and experiment with food makes camping into an opportunity to take your cooking skills outside the proverbial box of the kitchen. I admit I am nowhere near as ambitious as some of my friends–on our recent group outing to Crater Lake, Deanna had brought a spectacular peanut sauce with tofu and vegetables which was an exquisite luxury in the great outdoors, others had prepared complex grillable breakfast burritos based on well-seasoned soyrizo, marinated tofu, various vegetables which we wrapped in foil and cooked in the fire–all manner of creative and inspiring portable feasts. When Joe and I camp we bring only some pretty basic ingredients, but never fail to eat extremely well. For breakfasts we almost always bring oats, some soy or almond milk, and raisins to cook all together over a tiny gas stove. This is simple, impossible to do wrong, and provides a more than adequate base for a full day of physical activity. The oatmeal, however, only gets made after at least one or two rounds are deployed from our stalwart espresso maker from Italy. 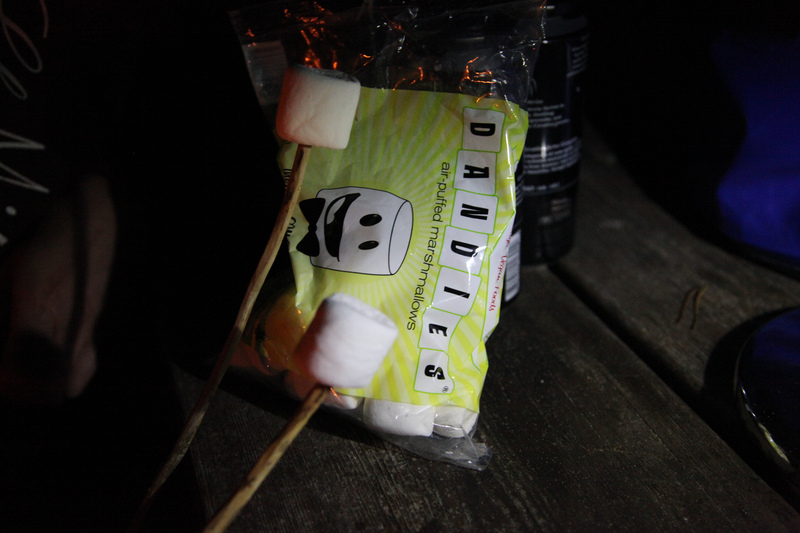 These little guys are perfect for camping. They are compact, easy to carry, and make great coffee no matter where you are! 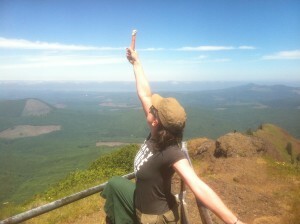 We usually eat lunch on the trail or on top of some mountain or other. 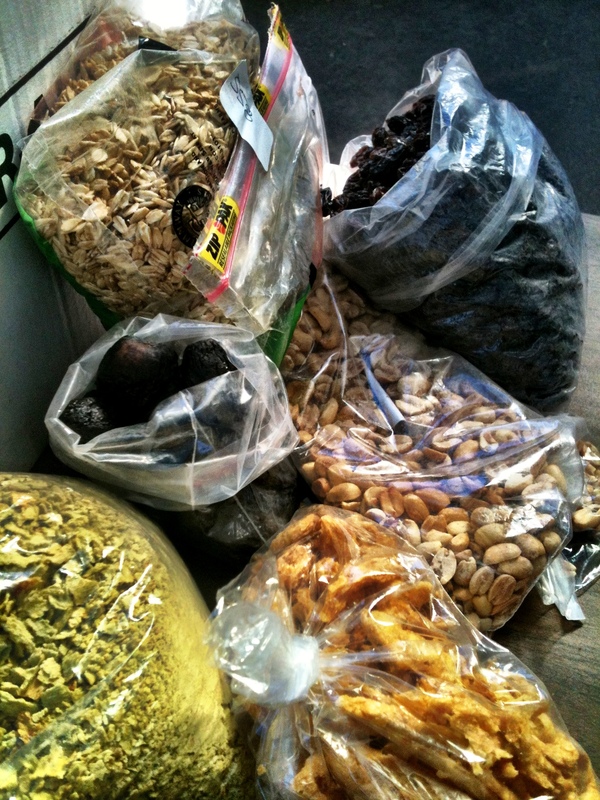 We keep our daypacks stocked with peanuts and raisins, almonds, dates, dried figs, mangoes or other lightweight fruits, and almost always have hummus and fresh crunchy veggies like carrots, celery and bell peppers. Folks are sometimes aghast by the idea of transporting hummus without refrigeration. You might actually be surprised at how well it holds up at air temperature! We actually, two years ago, had about three dozen tubs of hummus (LONG STORY) which we took along on a road trip through the plains states in July with no air conditioning. It was HOT. We were eating off of that hummus, which was just hanging out in a tote bag in the back of the car, for two weeks and it was great. Sounds shocking, perhaps, but we kept it out of direct sunlight and it held up just fine while keeping us going for a long time. Split pea soup with chili powder. Vegan hotdogs–getting better all the time. 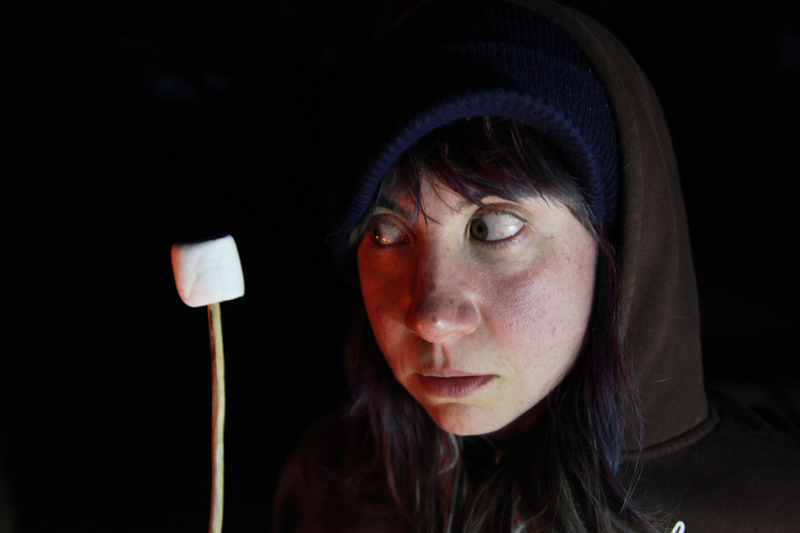 than coming in from a long, breathtaking hike and popping open a beer, building a campfire, and making a simple dinner with a sense of satisfaction that is amplified by being physically tired and having all your senses heightened by being outside–with the sounds of wildlife scurrying around your campsite, the moon lighting your way and the night breeze blowing through your sweatshirt? 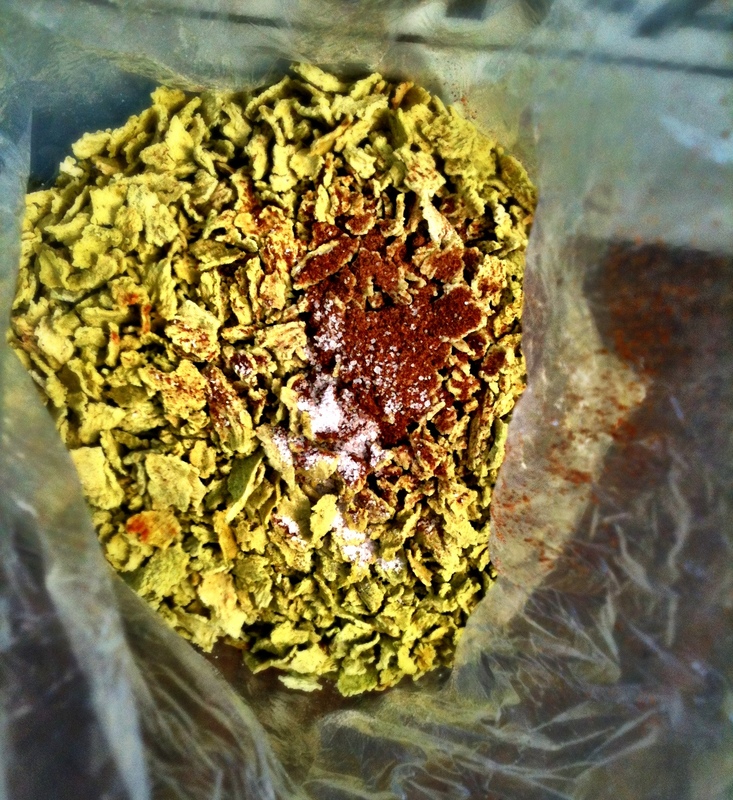 We like to bring dehydrated soups from our grocery store’s bulk bin, sometimes adding spices ahead of time (as these types of products can sometimes be a little plain on their own). 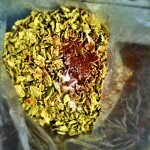 Sometimes we add soycurls or mix in some dried beans, and we often have some tortillas or something similar on the side. 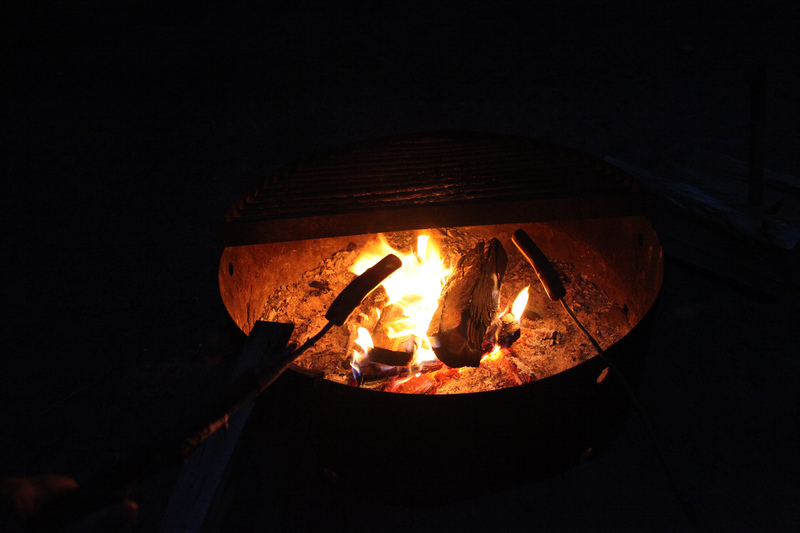 There are also some great vegan sausage products that cook up just great in the fire–the variety of selection seems to increase every year–you can get plain ol’ tofu hot dogs as well as products in the style of kielbasa, beer brats, apple sausage, italian sausauge, spicy chipotle, and on and on. I’m not crazy about processed meat analogs and certainly don’t eat them every day, but I am glad that they exist and who do I think I am? I love a good stick-cooked hot dog as much as anybody else. But what about marshmallows? It was a sad day for me, many many years ago, when I learned that most commercial marshmallows are made with gelatin, a slaughterhouse byproduct made of hooves and/or bones. There are “kosher” marshmallows which don’t have pig bits but are instead made with a fish byproduct. For years I thought I would never get to enjoy a marshmallow again. 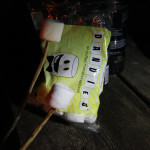 But happily for pigs, fish and people alike, Dandies makes a fantastic vegan marshmallow made with carrageenan, a coagulant derived from sea vegetables instead of gelatin. Like many things, carrageenan is something that is present in a lot of processed products and is not necessarily good for everyone in large doses. Being that I eat marshmallows only a few times a year and I would far prefer to consume carrageenan than the bottom of a pig’s foot, I am personally totally fine with this. I love Dandies and all I can say is that it’s a good thing I hike so much, because I can easily throw my own “moderation” standards out the window (made even easier ’cause I’m outside and don’t have a window) and put down half a bag by myself. I’m ready if you are, marshmallow. I remember spending what seemed like many twilight hours as a kid, when we had a firepit just down the path from my parents’ house in the country, perfecting my marshmallow toasting technique. I like them to be thoroughly soft and squishy on the inside, and evenly crispy on the outside. I don’t mind it when they burn black, but when I can get them that perfect crusty golden brown all over the exterior and manage to cook it evenly throughout so it’s warm and smushable but not going to take off the roof of my mouth, well, that’s a successful camping trip. PS: Joe claims that Crater Lake is not as freezing cold as you would think. PPS: I still will not jump into Crater Lake. 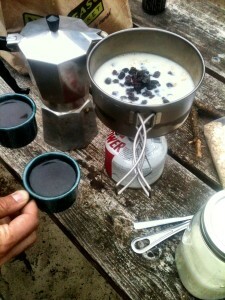 This entry was posted on August 27, 2013 by sadie in travel stories, Uncategorized and tagged camping.